Hi, today I’m going to share with you the meaning of Genesis 1:1. Now, I know you might be thinking, “I already know the meaning of Genesis 1:1,” but do you really? I’m going to explain what I believe the meaning of Genesis 1:1 is. In the beginning; now what does that mean? It means before you were born, before your great-great-great-great-great-great grandma and grandpa were born. It means even before Adam and Eve were made out of the dust of the earth, before God made land or birds of the air or fish of the sea; before any of that. In the beginning means when the world was nothing – there was not even the heavens! That’s what it means. 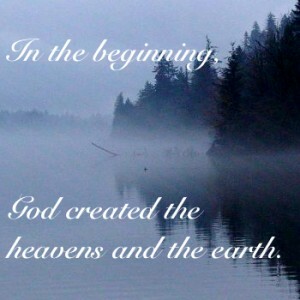 God created the heavens and the earth; what does that mean? It means that God, our Lord and Savior, made earth. But, it was just the ground; just dirt – there were not even trees or plants or fish. It was just water and dry land. There was nothing living or breathing – just water and dry land. And the heavens? No one knows much about them, except that they’re glorious. God finished the heavens on the first day; the day he put the earth in the sky. But, later He hung the sun, moon, and stars in them. This is what I believe the meaning of Genesis 1:1 is. Thank you for reading my post, please leave questions comments or things you would like to add below. Thank you! You write really well. Good Job! nice way to share about jesus sis!